John Anthony Franco was born September 17, 1960 in New York City at Bensonhurst, Brooklyn. As a boy in Brooklyn he idolized the 1969 Mets and imagined he was Tug McGraw when he pitched in his back yard to his brother. Franco is the Italian American son of a New York City Dept. of Sanitation worker, Franco would wear his dads NYDS T-shirt under his uniform jersey in honor of his father. During his college days Franco wanted to quit school to make money, at the time he had no car & was taking the train from Brooklyn to Queens. His father gave him some tough talk along with some encouragement changing his mind. From then on, his determination got him to the big leagues. He was a little guy with a tough talking, fierce pitching attitude. He didn't come at hitters with blazing fastballs but a dropping screwball much like his idol Tug McGraw. Franco attended the famous Lafayette High School, in the Bath Beach section of Brooklyn. 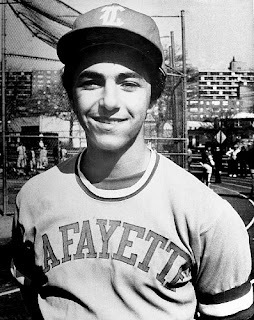 The school has produced famous baseball alumni including; Sandy Koufax, the Aspromonte brothers Bob & Ken, Pete Falcone, Fred Wilpon, Al Ferrara, Danny Baez & Luis Lopez. Other famous non sports people include Paul Sorvino, Vic Damone, Larry King & Peter Maxx. Franco then attended St. John’s University & pitched two no hitters there, becoming the Red Men's star pitcher. While playing there he became friends with future Mets pitcher & A.L. Cy Young Award winner Frank Viola. Franco also became close with legendary St. John's basketball coach Lou Carnesecca, who also became a mentor to the young Franco. In the 1979 North East regional finals, the surprising Red Men went up against the mighty Nebraska team. The Nebraska coach was talking a lot in the papers, saying how they would roll over St. Johns & move on to the College World Series. 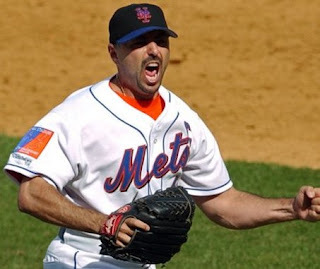 John Franco was a starter then, he went out & pitched a no hitter upsetting the Nebraska team. The five foot ten left hander was drafted by the Los Angeles Dodgers in 1981, in the fifth round. He was eventually traded to the Cincinnati Reds for Rafael Landestoy in 1983. He went 6-10 with a 4.85 at AAA Indianapolis that year & made the Reds staff out of Spring Training in 1984. He debuted two weeks into the season pitching the 8th inning in a game against the Braves in Atlanta. Franco earned his first career save in San Francisco against the Giants on April 27th pitching two scoreless innings. He saw a lot of action that May winning his next two decisions & then earning two saves as well. In his 1984 rookie year he was 6-2 with four saves striking out 55 batters in 79 innings posting a 2.61 ERA 54 appearances. The next season he kept betting as the year went on, he went 12-2 with 12 saves a 2.18 ERA eventually taking over as the Reds closer from pitcher Ted Power. By 1986 he became one of the league’s top firemen relief pitchers making his first All Star team as well. He saved 29 games that year (5th in the league) going 6-6 with a 2.94 ERA making 74 appearances. In 1987 he made his second straight All Star team & began a string of five straight season saving 30 or more games. He saved 32 games & led the league finishing off 60 games posting a 8-5 record with a 2.52 ERA. In 1988 he was even better, as he led the league for the first time with a career high 39 saves, posting a fantastic 1.57 ERA. He won the Rolaids Relief Man of the Year Award and became a popular player in Cincinnati. He went 6-6 finishing off the most games in the NL once again (61) making 70 appearances overall. Franco received votes for the league's MVP coming in 12th in that category. He posted ERA’s under three every season but his last in Cincinnati; posting a 3.12 ERA in 1989. 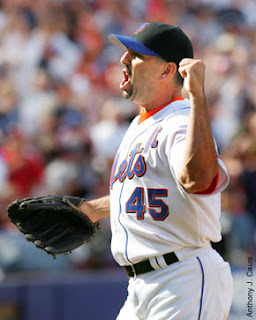 He saved 32 games going 4-8 striking out 60 batters in 80 innings pitched over 60 appearances. The Reds hard throwing Ron Dibble went 10-5 that year with 141 strike outs in just 99 innings pitched & posted a 2.09 ERA. In Franco's last four seasons at Riverfront Stadium, the Reds finished in second place each year. Franco had a desire to return home to New York & the Reds decided to part ways with him as well. He was traded to the New York Mets for Randy Meyers. Meyers would join Dibble & Norm Charlton in the Reds bullpen, becoming known as the Nasty Boys. They would led Lou Pinella’s Reds to a surprising World Series win over the Bash Brothers & the mighty Oakland A’s. For Franco in December 1989 one of his dreams came true, he was traded to the team he rooted for as a child. Franco was thrilled to be back at home in New York, & quickly became a fan favorite. He would eventually be named the third team captain in New York Mets history. Franco was a true leader not only on the field but off the field as well. He was always the guy trying to get the team together after games & when the plane landed in different cities. 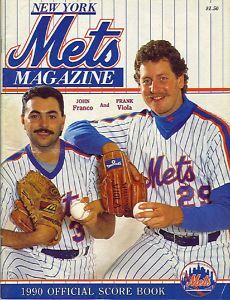 When he got to the Mets pitching staff he was reunited with his good frieend from the St. Johns days, fellow New Yorker & the new ace of the Mets staff Frank Viola. 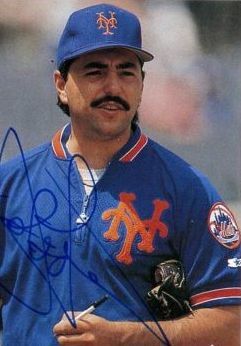 Viola would win twenty games (20-12) for the 1990 Mets. 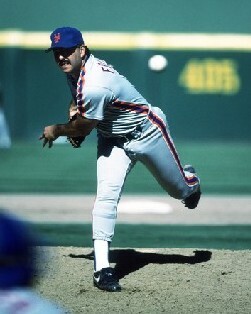 He made his Mets debut at Shea Stadium in the second game of the season, earning a save against the Pittsburgh Pirates. He had a great month of April finishing off with six saves and a 1.08 ERA. In June he was again fantastic as he saved six games, earned two victories & blew just one opportunity in 12 appearances. From the 4th of July through September 5th he saved 17 games, took no losses nor did he blow any save opportunities. In that time he allowed just six earned runs in 22 innings of work notching 17 strike outs as well. He certainly kept the Mets in the pennant race, although they could not overtake the Pittsburgh Pirates in the end & finished second. 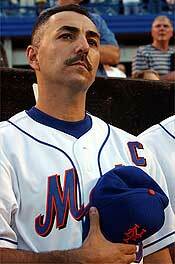 That season the Mets fired Davey Johnson & hired long tome Met favorite Bud Harrelson to take over the helm. In Franco's first season at Shea, he set a Mets save record & led the National league with 33 saves. He posted a 2.53 ERA on the season, going 5-3 with 56 strikeouts in 67 innings. Franco made the All Star team & won the Rolaids Relief man of the Year Award once again. 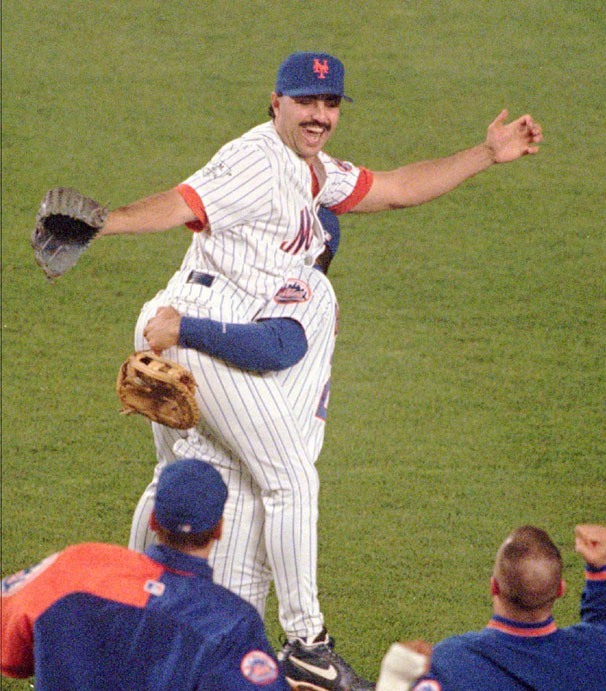 In 1991 he started out the season with an Opening Day save, relieving Dwight Gooden in a 2-1 victory over Terry Mulholland & the Philadelphia Phillies. By the All Star break he had six losses with three Blown saves, but had already had over 20 saves. In the second half of the season the Mets didn't win too much as the team fell to fifth place on the year. Manager Bud Harrelson was fired & Mets coach, Mike Cubbage became the interim manager closing out the season. Franco saved 30 games overall (3rd in the league) going 5-9 with a 2.93 ERA. He struck out 45 batters in 55 innings of work making 52 appearances. 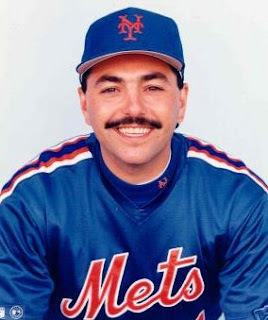 In 1992 Jeff Torborg took over as a bunch of high priced free agents who were either past their prime or just couldn’t adjust in New York, made up the so called worst team money could buy. 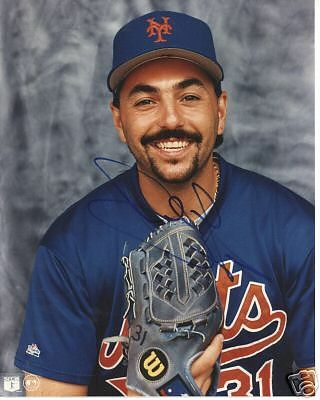 Players like Eddie Murray, Bobby Bonilla, Bret Saberhagen, Willie Randolph, as well as former 1986 Mets stars Dwight Gooden, Howard Johnson, & Sid Fernandez only put together 72 wins as a team. Franco missed time due to an injury, seeing action in just 31 games. He went 6-2 with 15 saves posting a 1.62 ERA. In 1993 he started out the year well although he went on the DL twice & only pitched in eight games the first two months of the season. He was 2-0 with two saves holding an ERA under one at 0.96 on June 2nd. He blew two saves in June & then saved seven games straight, only blowing one opportunity over the next two months. As September was a wash for the team, Franco blew four opportunities in the month earning just one win & save. Overall with the injuries he had an off season, posting a 5.20 ERA, going 4-3 with his lowest amount of saves since being in the closer role (10). He rebounded in 1994 starting out the year with six straight saves in six opportunities. By the All Star break he already had 19 saves posting a 2.72 ERA. When play resumed he saved eleven of twelve opportunities & was headed for possibly his beat save season. Unfortunately the baseball season ended in early August due to the baseball players union strike. Franco finished with good numbers that would have been even better had play went on as usual. He led the NL in saves for the third & final time in his career with 30. He went 1-4 making 47 appearances, while posting a 2.70 ERA. He struck out 42 batters in 50 innings walking just 19. He came in 7th in the Cy Young voting & received some votes for the MVP award as well. As play resumed in 1995 Franco blew a save in Colorado on Opening Day at Coors Field, giving up a game tying double to Larry Walker. The Rockies won it on Dante Bischette’s walk off HR off the Mets' Mike Remlinger. But Franco adjusted well, by the All Star break he was 4-1 with 11 saves & a 2.32 ERA. From August through the end of the season he converted 15 of 16 save opportunities allowing just four earned runs in 18 innings of work over twenty games. For the 1995 season, he saved 29 games (8th in the league) going 5-3 with a 2.44 ERA in 47 appearances. He played a superior defense on the mound, posting a perfect .1000 fielding % for the second straight year. The left hander continued being one of the game’s best most durable relievers. On April 29th, 1996 he recorded his historic 300th career save on a foggy night at Shea Stadium against the Montreal Expos. He had 19 saves by the All Star break and only nine more in the second half. The chances just weren’t there as he did lower his ERA to 1.83 by the end of the season. He finished up with 28 saves (10th in the NL) at 4-3 with 48 strikeouts in 58 innings pitched over 51 appearances. In 1997 he blew a save at San Diego in the second game of the season allowing an RBI base hit to Tony Gwynn. From there he converted 12 straight save opportunities & by the All Star break had twenty saves. Franco continued to roll along as he blew just two opportunities in the second half of the season, turning one of them into a win. On the year he saved 36 games (4th in the league) going 5-3 with a 2.55 ERA striking out 53 batters in 60 innings making 59 appearances. In 1998 he saved 38 games (5th in the league) but was 0-8 with a 3.62 ERA, allowing the second most walks & earned runs of his career. That season when the Mets acquired Mike Piazza, Franco gave up his uniform #31 to Piazza, and took over uniform #45, Tug McGraw’s old number. He was now 38 years old and starting to age. He still made 61 appearances & struck out 59 batters in 64 innings finishing 54 games.